The candidate is also eligible for career guidance for self-employment. Ascertaining the eligibility of the candidate by Registration Officials. Candidate is to Register in the nearest Employment Exchange where the candidate resides. Pre-Registration guidance by Registration Officials. To get Registration in any Employment Exchanges of Assam, the candidates or their parent's residence / place of residence should be for about 20/25 years within the State of Assam. There is no fee for registration. Employment service is free. 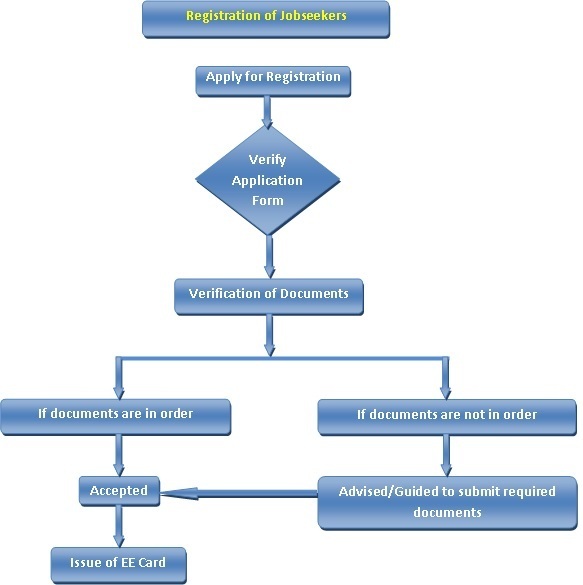 List of original documents (To be shown) and attested copies thereof (to be submitted) at the time of applying for Registration. 3 copies of Self attested recent Passport size photographs. Assam Schedule LXIII, Form No. 1. The candidate has to fill the information from sl. 5 till sl. 23. Information which is not applicable may be left blank. Optional questionnaire may also be filled. The registration of job seekers would be allowed during all the working hours of the working day. A notice to this effect may be displayed suitably for the information of visitors. The registration time is 10:00 am to 2:00 pm on all working days except Govt. Holidays. At present the service is provided offline. Registration Officials of District Employment Exchanges / Employment Exchange / University Employment Information and Guidance Bureau, etc. Copyright © All Rights Reserved Directorate of Employment and Craftsmen Training, Government of Assam.